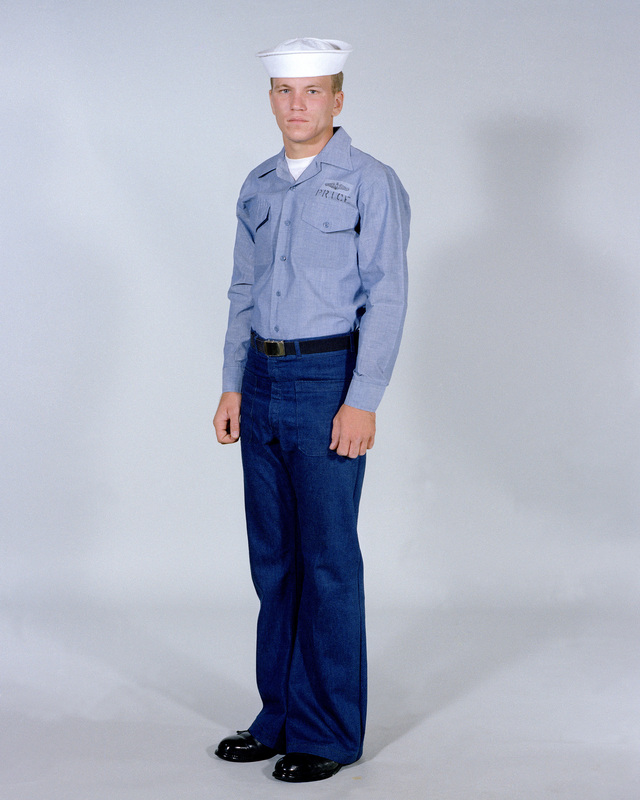 In 2016, the U.S. Navy announced it would dump the much-derided NWU Type I — also known as the “blueberry” or “aquaflage” — after it was revealed in 2012 that the uniforms are flammable. Fire, of course, is one of the greatest threats to sailors. That was the worst of several problems, such as the fact that camouflaged NWU Type Is are blue, black and gray, and were worn by sailors working on ships … at sea. It was a terrible design. The Navy is replacing them with green camouflage — NWU Type IIIs — for use ashore by October 2019. 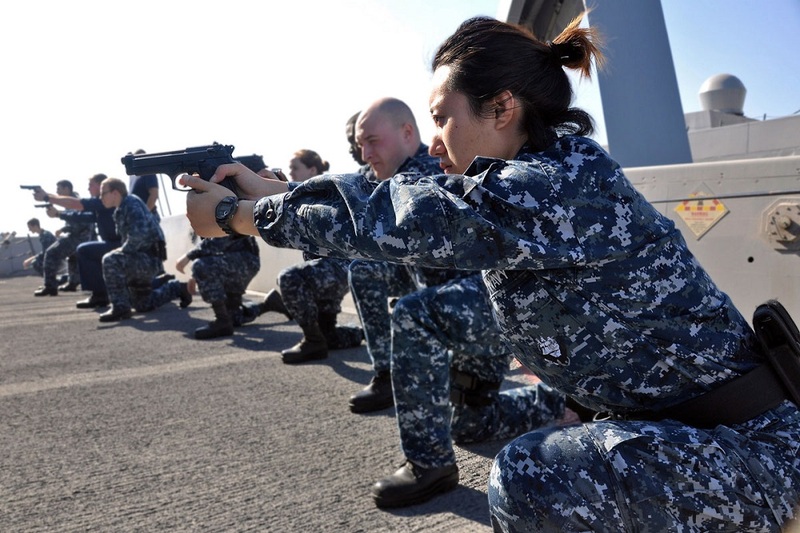 Although why, precisely, sailors need a separate, green camo uniform is not exactly clear. The Type I was designed for easier washing and in part to hide stains and fresh paint, which were more apparent on the preceding plain-blue “utilities” uniform, which replaced the famous dungarees which sailors wore from 1913 until the 1990s. But there are many more problems with Navy uniforms which any sailor would be very familiar with, and a November 2017 article by Capt. Vince Augelli in Proceedings, the U.S. Naval Institute journal, is a refreshing and blunt look at the matter. Mainly, the uniform situation remains a big mess. 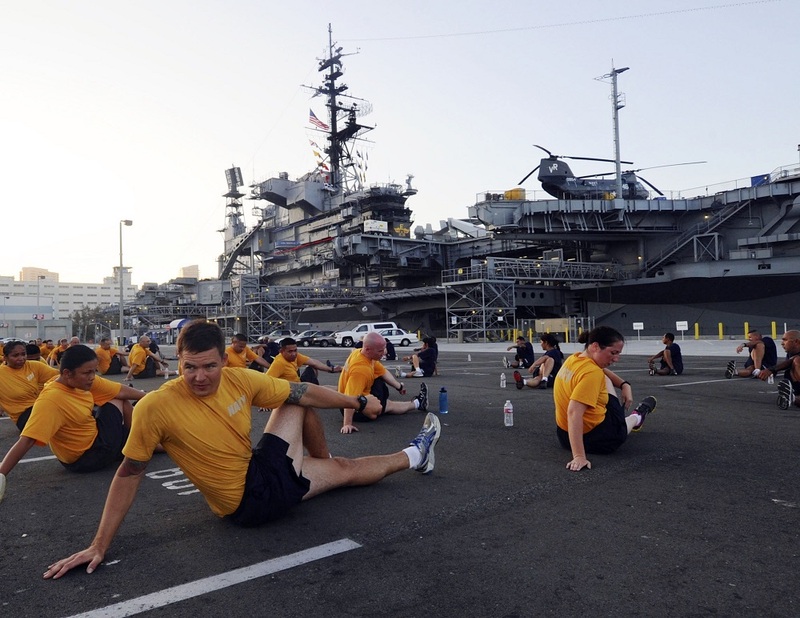 The U.S. Navy has too many different everyday uniforms. 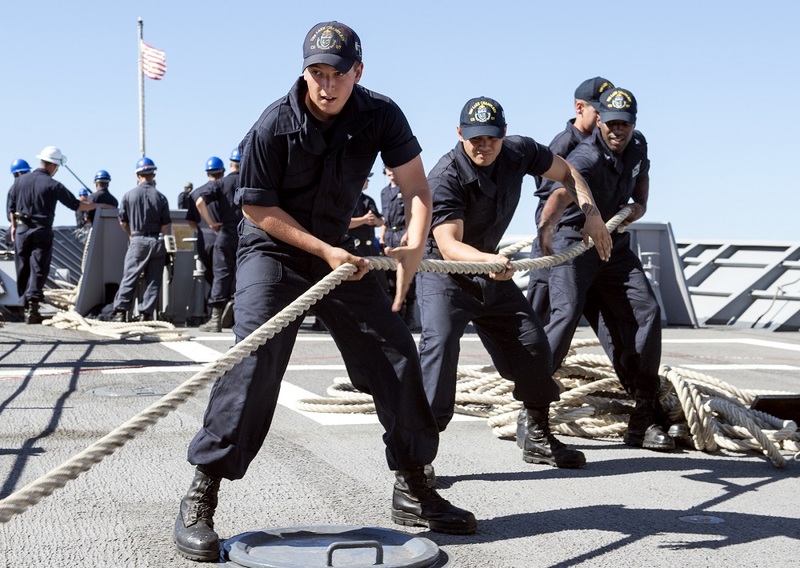 The service takes far longer than the other branches to make changes, and flame-resistant coveralls — introduced as an at-sea replacement for the blueberries — have limited availability, and sailors at sea are issued only two. The Navy is rolling out a replacement for these, too. To add more annoyance, the sailing branch doesn’t allow sailors to wear “working” uniforms — again, we’re referring to the blueberries and the camo-green Type IIIs — in the Pentagon without special permission “that takes months of paperwork,” Augelli points out. Who wears similar, rugged, camouflaged working uniforms in the Pentagon? The Army, Air Force and Marines — wisely so because even Pentagon work can involve more than sitting behind a desk. Enlisted sailors at the Pentagon wear black-and-khaki service uniforms which look like something an officer would wear. “At the end of the evolution the sailor is missing ribbons and has scratched his belt buckle and scuffed his leather shoes,” Augelli writes. It’s worth reading Augelli’s recommendations, especially his advice to allow sailors to wear a universal uniform at sea, on land and at the Pentagon. The Navy needs to simplify itself. As a personal preference, and Augelli may disagree, the U.S. Navy should take a hint from the Royal Navy’s named-by-committee but nonetheless practical “R.N. 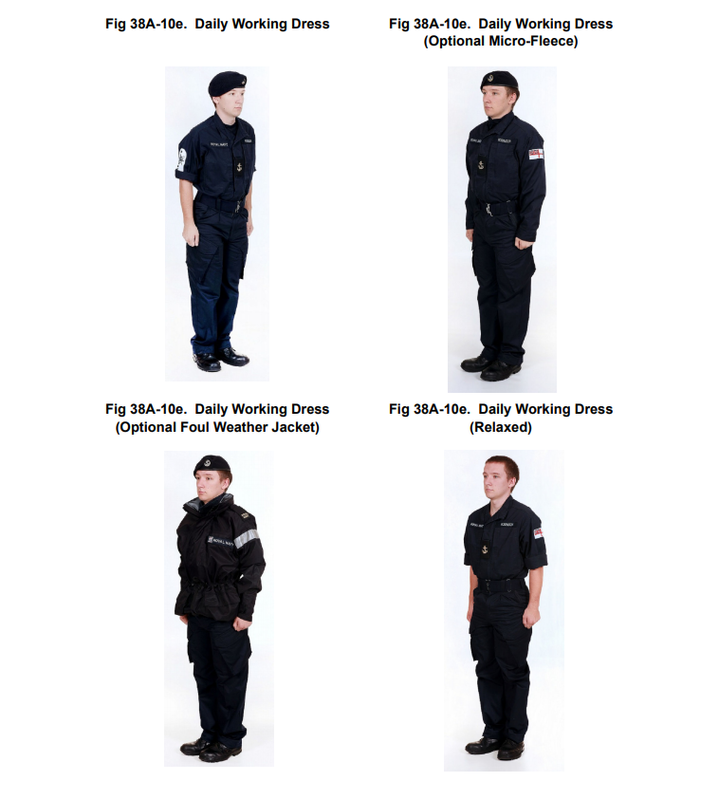 Personal Clothing System,” although the United Kingdom’s sailors wear a more formal-looking “general duty rig” when working ashore. It’s fine. Except swap the beret for a hat. Or just remake the dungarees with modern materials. But please, U.S. Navy, ditch the camouflage. It doesn’t suit you.